Experience the World Heritage-listed natural wonder of Iguazu Falls on this guided 4-day tour from Buenos Aires. Travel by overnight coach to the subtropical province of Misiones, and tour both the Argentinian and Brazilian sides of the falls. Soak up spectacular views of more than 200 different cascades from a series of footbridges and walkways, and stand at the lip of the spectacular Devil’s Throat. Enjoy free time to explore the town of Puerto Iguazú, and learn about the area’s amazing biodiversity from a professional guide. Take a detour from the urban bustle of Buenos Aires to experience one of Earth’s most impressive natural attractions. Travel to the northern Argentinian province of Misiones aboard an overnight coach, and enjoy an afternoon of free time to explore the town of Puerto Iguazú when you arrive. Over the next two full days, explore the subtropical national parks on both the Argentinian and Brazilian sides of the falls with a professional guide. Get an up-close view of the many different cascades on a series of footbridges, catwalks and forest paths, and take an optional boat cruise near the base of the thundering Devil’s Throat (additional expense). The 4-day tour includes round-trip coach fare, guided tours, daily breakfast and two nights at your choice of inn-style or superior lodging in Puerto Iguazú. Please note: National Park fees are not included. See Itinerary below for a description of each day on this unforgettable World Heritage adventure. 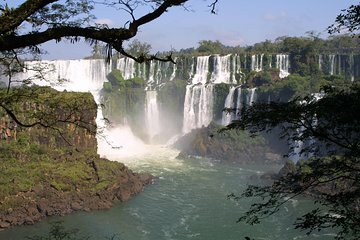 Depart Buenos Aires in the evening and head to Iguassu Falls on a comfortable, fully equipped overnight bus. The bus has a bathroom, heating, and air conditioning, and the seats recline 160 degrees. You'll be served dinner and breakfast while on board. Bus estimated duration is 20 hs - Distance between Buenos Aires and Puerto Iguazu approx. 1,000 miles (1,600km). Arriving in Puerto Iguazú around noon, you'll be taken to your hotel where you can relax and enjoy a day of leisure. Feel free to stroll into town, visit the bird park or simply relax in the tropical setting – spas and restaurants are plentiful! After breakfast, depart on a full-day tour to the Argentinian side of Iguazu Falls for close-up views of the Iguazú River. The lower and upper walkways allow for comprehensive views of the thundering falls. Walk along the trails that make their way through the 210-square-mile (543-square-km) reserve, and enjoy the various aerial and panoramic views of the falls. An ecological train ride through the park is included in your tour, and you'll also have the option to upgrade to a sightseeing cruise at an additional cost. After breakfast, enjoy a half-day excursion to the Brazilian side of the Iguazu Falls for an up-close look at Devil's Throat, the largest single waterfall in the region. After your tour, board the bus for your overnight return trip to Buenos Aires. You will arrive in Buenos Aires. Important: You MUST confirm and obtain any visa requirements prior to crossing into the Brazilian side of Iguassu Falls. All visa requirements are the sole responsibility of the traveler. All bus tickets must be printed to travel. Please note that the exact bus schedule for Day 1 and Day 4 will be confirmed a week prior to your travel date. The tour operator changed our bus departure time from 7:30pm to to 2:30 pm. They did NOT give us any option. This did not allow us to tour Buenos Aires. The bus they put us on was BAD and very uncomfortable. It took more than 25 hours to reach our hotel. It was SICKINGLY slow bus. I would NOT take this tour with this company. It was a wonderful tour to the Iguazu falls! The only thing I could say was WoW when I saw the falls for the first time. Never in my life Ive experienced such a remarkable and more than beautiful natural phenomenon. Excellent guide Diego took us both to the Argentinan and Brasilian side one side more spectacular than the other. Hotel Jasy was cosy and had a superb kitchen. The only disadvantage is the travel by bus: too long and not always comfortable. But all in all I could recommand this trip by all means. If you have the time and money, you must do this. Trip to the Iguassu Falls is an adventure of a lifetime. The waterfalls are simply breath-taking. The Rio Uruguay coach was very comfortable and the hotel was something of a tropical paradise. My tour guide was an awesome guy who made the trip FUN! Brilliant from start to finish despite the first bus developing break problems, and the second replacement bus being defected before reaching Iguassu. The falls are really out of this world. Awesome does not do them justice. Hotel accommodation was excellent, as also the transfers from hotel to the falls. Great tour. Well organized with good guides. Best way to see the falls comprehensively over 2 days. Still don't know which side I liked better. The highlight of the visit to Argentina, the two and one half days is a perfect amount of time. I was very disappointed by this tour. For starters, I paid for a "Superior Room" at what I thought was going to be a four-star hotel. Neither the hotel nor the room were four-star. The worse part was that I ended up in a room with three single beds. When I asked about it at the front desk, the gentleman told me that was "all they had available". The hotel was shabby, dull, not super-clean, and very plain vanilla. When I contacted the local agency about it, she offered me a free tango show. That was not what I was looking for. She didn't realize I had just arrived and wanted her to do something about my accommodations. When she finally did, it was 8PM the night before I was leaving. She (her name is Lucia from Say Hueque) was horrible. The bus ride was very long and it did not feel very clean. I saw the worker on the bus recycle the blankets and pillows immediately after they were already used by another passenger. The bathroom on the bus was atrocious. The saving grace to this trip was that the Falls were actually spectacular and the local tour guide who took us to both sides of the Falls (here name was Graciela) was fantastic. 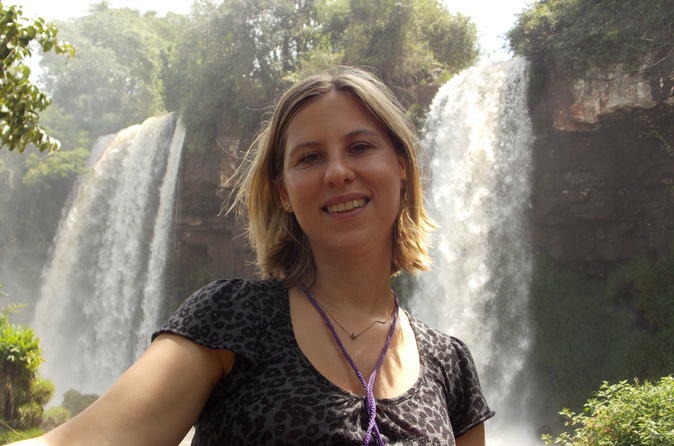 My suggestion: fly to Iguassu, stay at a five-star hotel with excellent reviews, and save yourself the hassle. Great. Experience of a life time for me and my wife. We travel a lot and one of those very memorable. The guide was terrific. Awsome trip! Buses had excellent comfort, meals and service. Both tours to waterfalls had lovely tour guides and great organisation.Views were amazing! I enjoyed Mojitos by the pool (3,5*hotel) and also purchased additional 4 hours tour through this operator to experience rappelling and a zipline. The trip was great! The Falls was beautiful, the guides were especially nice and spoke very good English and the transfers were prompt and comfortable. Also, the St. George hotel was very nice. The only reason you didn't get a 5* from me is because the add in the internet as well as the ticket/vouchers stated that the bus to/from Buenos Aires had seats that reclined 180 degrees, and while some did on the lower level, ours did not on the upper level. I don't remember anyone asking our preference since there was a difference. I feel I was led to believe something different than what was actually received. You may want to remedy that for future clients.